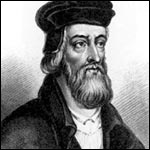 John Wycliffe (also Wyclif, Wycliff, or Wickliffe) (c.1320 – December 31, 1384), an English theologian and early proponent of reform in the Roman Catholic Church during the fourteenth century, was born in Yorkshire, England. He worked tirelessly on an English translation of the Bible in one complete edition and is considered a precursor of the Protestant Reformation. Since his beliefs and teachings seemed to compare closely with Luther, Calvin, and other reformers, historians have called Wycliffe "The Morning Star of the Reformation." 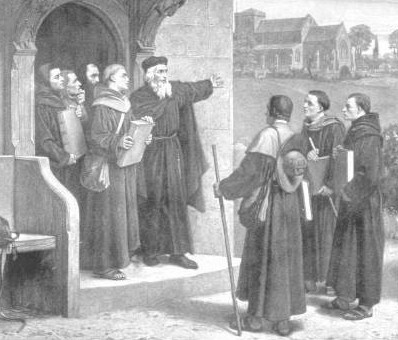 The itinerant preachers, called Lollards, Wycliffe sent throughout England, created a spiritual revolution. Intense persecution, from both the religious and secular authorities, cracked down on the Lollards sending the movement underground. The seeds of reform that Wycliffe planted were not to blossom until a couple hundred years later. Wycliffe was born in the small village of Ipreswell in Yorkshire, England. 1324 is the year usually given for Wycliffe's birth although the exact date is not known. His family was of early Anglo-Saxon origin, long settled in Yorkshire. In his time, the family was a large one, covering considerable territory, principally centered around Wycliffe-on-Tees, of which Ipreswell was an outlying hamlet. The power of his genius and the extent and thoroughness of his knowledge commanded the respect of both friends and foes. His adherents saw with satisfaction that their champion stood foremost among the leading minds of the nation; and his enemies were prevented from casting contempt upon the cause of reform by exposing the ignorance or weakness of its supporter. John de Balliol whose seat was in the neighborhood of Wycliffe's home had founded Balliol College, Oxford to which Wycliffe belonged, first as scholar, then as master. He attained the headship no later than 1360. In 1361, he was presented by the college with the parish of Fylingham in Lincolnshire. For this he had to give up the leadership of Balliol, though he could continue to live at Oxford. As baccalaureate at the university, he busied himself with natural science and mathematics, and as master he had the right to read in philosophy. Obtaining a bachelor's degree in theology, Wycliffe pursued an avid interest in Biblical studies. His performance led Simon Islip, Archbishop of Canterbury, to place him at the head of Canterbury Hall in 1365, where twelve young men were preparing for the priesthood. Islip had designed the foundation for secular clergy; but when he died in 1366, his successor, Simon Langham, a man of monastic training, turned the leadership of the college over to a monk. Though Wycliffe appealed to Rome, the outcome was unfavorable to him. Between 1366 and 1372 he became a doctor of theology, making use of his right to lecture upon systematic divinity. But these lectures were not the origin of his Summa. In 1368 he gave up his living at Fylingham and took over the rectory of Ludgershall, Buckinghamshire, not far from Oxford, which enabled him to retain his connection with the university. Six years later in 1374, he received the crown living of Lutterworth in Leicestershire, which he retained until his death. In 1348, Wycliffe saw the fearful plague, the Black Death, that started in Asia and spread across Europe, reaching England in August. It caused the death of about half his nation's population and two-thirds of Wycliffe's home village. This disaster deeply affected Wycliffe. Merle d'Aubigne records, "This visitation of the Almighty sounded like the trumpet of the judgement-day in the heart of Wycliffe." Having watched people near him dying, Wycliffe desperately called out in prayer and seriously studied the Word of God looking for protection from the "judgment" he felt was imminent. Although Wycliffe reviewed the writings of other scholars, he placed the greatest emphasis on his own study of God’s Word. He concluded that the entire structure of the Papal Empire was built upon superstition and contradicted the Holy Scripture. He felt it was his mission to teach that the Bible was the supreme authority for the Church and to denounce the Pope and his claims to infallibility. Wycliffe was well acquainted with the tendencies of the ecclesiastical politics to which England owed its position. He had studied the proceedings of King Edward I of England, and had attributed to them the basis of parliamentary opposition to papal usurpation. He found them a model for methods of procedure in matters connected with the questions of worldly possessions and the Church. Many sentences in his book on the Church recall the institution of the commission of 1274, which caused problems for the English clergy. He considered that the example of Edward I should be borne in mind by the government of his time, but that the aim should be a reformation of the entire ecclesiastical establishment. He held a similar position, fully reflected in his political tracts, on the enactments induced by the ecclesiastical politics of Edward III, with which he was well acquainted. Wycliffe participated in the peace congress at Bruges. There in 1374, negotiations were carried on between France and England, while at the same time commissioners from England dealt with papal delegates respecting the removal of ecclesiastical annoyances. Wycliffe was among these, under a decree dated July 26, 1374. The choice of a harsh opponent of the Avignon system would have broken up rather than furthered the peace negotiations. His predecessor in a like case was John Owtred, a monk who formulated the statement that St. Peter had united in his hands spiritual and temporal power, the opposite of what Wycliffe taught. In the days of the mission to Bruges, Owtred still belonged in Wycliffe's circle of friends. During this time, Wycliffe was regarded by papal partisans as trustworthy. The controversies in which men engaged at Oxford were philosophical rather than purely theological or ecclesiastical-political, and the method of discussion was academic and scholastic. Owtred believed it sinful to say that temporal power might deprive a priest, even an unrighteous one, of his temporalities. Wycliffe regarded it as a sin to incite the pope to excommunicate laymen who had deprived clergy of their temporalities, his dictum being that a man in a state of sin had no claim upon government. Wycliffe blamed the Benedictine professor of theology at Oxford, William Wynham of St. Albans (where the anti-Wycliffite trend was considerable), for making public controversies which had been, until this point, confined to the academic arena. But the controversies were fundamentally related to the opposition which found expression in parliament against the Curia. Wycliffe himself tells (Sermones, iii. 199) how he concluded that there was a great contrast between what the Church was and what it ought to be, and saw the necessity for reform. His ideas stress the perniciousness of the temporal rule of the clergy and its incompatibility with the teachings of Christ and the apostles, and make note of the tendencies that were evident in the measures of the "Good Parliament" (1376–77). A long bill was introduced, with 140 headings, which stated the grievances caused by the aggressions of the Curia, the central administration governing the Roman Catholic Church. All reservations and commissions were to be done away, the exportation of money was forbidden, and the foreign collectors were to be removed. Wycliffe was no longer satisfied with his chair as the means of propagating his ideas, and soon after his return from Bruges he began to express them in tracts and longer works—his great work, the Summa theologiae, was written in support of them. In the first book, concerned with the government of God and the Ten Commandments, he attacked the temporal rule of the clergy. But he entered the politics of the day with his great work De civili dominio. Here he introduced those ideas by which the good parliament was governed which involved the renunciation by the Church of temporal dominion. The items of the "long bill" appear to have been derived from his work. In this book are the strongest outcries against the Avignon system with its commissions, exactions, squandering of charities by unfit priests, and the like. To change this is the business of the State. If the clergy misuses ecclesiastical property, it must be taken away and if the king does not do this, he is remiss. The work contains 18 strongly stated theses, opposing the governing methods of the rule of the Church and the straightening out of its temporal possessions. Wycliffe had set these ideas before his students at Oxford in 1376, after becoming involved in controversy with William Wadeford and others. Rather than restricting these matters to the classroom, he wanted them proclaimed more widely and wanted temporal and spiritual lords to take note. Wycliffe wanted to see his ideas actualized. His fundamental belief was that the Church should be poor, as in the days of the apostles. He had not yet broken with the mendicant friars, and from these John of Gaunt chose Wycliffe's defenders. Even though Wycliffe later claimed that it was not his purpose to incite temporal lords to confiscation of the property of the Church, the real tendencies of the propositions remained unconcealed. The result of the same doctrines in Bohemia—the land that was richest in ecclesiastical foundations—was that in a short time the entire church estate was taken over and a revolution brought about in the relations of temporal holdings. It was in keeping with the plans of Gaunt to have a personality like Wycliffe on his side. Especially in London Wycliffe's views won support. Partisans of the nobility attached themselves to him, and the lower orders gladly heard his sermons. He preached in city churches, and London rang with his praises. The first to oppose his theses were monks of those orders that held possessions, to whom his theories were dangerous. Oxford and the episcopate were later blamed by the Curia, which charged them with so neglecting their duty that the breaking of the evil fiend into the English sheepfold could be noticed in Rome before it was in England. Wycliffe was summoned before William Courtenay, Bishop of London, on February 19, 1377, in order "to explain the wonderful things which had streamed forth from his mouth." The exact charges are not known, as the matter did not get as far as a definite examination. Gaunt, Henry Percy (first Earl of Northumberland), and a number of other friends accompanied Wycliffe, and four begging friars were his advocates. A crowd gathered at the church, and at the entrance of the party animosities began to show, especially in an angry exchange between the bishop and Wycliffe's protectors. Gaunt declared that he would humble the pride of the English clergy and their partisans, hinting at the intent to secularize the possessions of the Church. The assembly broke up and the lords departed with their protege. Most of the English clergy were irritated by this encounter, and attacks upon Wycliffe began. The writings of Wycliffe were controversial and his opponents charged Wycliffe with blasphemy and scandal, pride and heresy. He appeared to have openly advised the secularization of English church property, and the dominant parties shared his conviction that the monks could better be controlled if they were relieved from the care of secular affairs. The bitterness brought about by this advice stemmed from the fact that at that time the papacy was at war with the Florentines and was in dire straits. The demand of the Franciscans that the Church should live in poverty as it did in the days of the apostles was not pleasing in such a crisis. It was under these conditions that Pope Gregory XI, who in January 1377 had gone from Avignon to Rome, sent, on May 22, five copies of his bull against Wycliffe, dispatching one to the Archbishop of Canterbury, and the others to the bishop of London, King Edward III, the chancellor, and the university. Among the enclosures were 18 theses of his, which were denounced as erroneous and dangerous to Church and State. The reformatory activities of Wycliffe effectively began at this time. All the great works, especially his Summa theologiae, are closely connected with the condemnation of his 18 theses, while the entire literary energies of his later years rest upon this foundation. The next aim of his opponents was to make him appear as a revolutionary in politics but that failed. On June 21, 1377, King Edward III died. His successor was Richard II, a boy, who was under the influence of John of Gaunt, his uncle. So it resulted that the bull against Wycliffe did not become public until December. Parliament, which met in October, came into sharp conflict with the Curia. Wycliffe tried to gain public acceptance by presenting his theses before parliament, and then made them public in a tract, accompanied by explanations, limitations, and interpretations. After the session of parliament was over, he was called upon to answer, and in March 1378, he appeared at the Episcopal palace at Lambeth to defend himself. The preliminaries were not yet finished when a noisy mob gathered with the purpose of saving him. The king's mother, Joan of Kent, also took up his cause. The bishops, who were divided, satisfied themselves with forbidding him to speak further on the controversy. At Oxford, the vice chancellor, following papal directions, confined Wycliffe for some time in Black Hall, from which Wycliffe was released on threats from his friends. Wycliffe demanded in his De incarcerandis fedelibus that it should be legal for the excommunicated to appeal to the king and his council against the excommunication. In this writing he explained his views in such a way that the laity could understand it. He wrote his 33 conclusions in Latin and English. Before any further steps could be taken in Rome, Pope Gregory XI died (1378). Wycliffe had already begun one of his most important works of dealing with what he perceived as the truth of Holy Scripture. The sharper the strife became, the more Wycliffe had recourse to his translation of Scripture as the basis of all Christian doctrinal opinion, and expressly tried to prove this to be the only norm for Christian faith. In order to refute his opponents, he wrote a book in which he endeavored to show that Holy Scripture contains all truth and, being from God, is the only authority. To Wycliffe, there is one universal Church, and outside of it there is no salvation. He was convinced that the head of the Church is Christ and therefore, the pope may not say that he is the head. Wycliffe's books had to do with the reform of the Church, in which the temporal arm was to have an influential part. Especially interesting is the teaching that Wycliffe addressed to the king on the protection of his theologians. This did not mean theology in its modern sense, but knowledge of the Bible. Since the law must be in agreement with Scripture, knowledge of theology is necessary to the strengthening of the kingdom. Therefore, the king has theologians in his entourage to stand at his side as he exercises power. It is their duty to explain Scripture according to the rule of reason and in conformity with the witness of the saints. The theologians also proclaim the law of the king as well as protect his welfare and that of his kingdom. The books and tracts of Wycliffe's last six years include continual attacks upon the papacy and the entire hierarchy of his times. Eventually, the pope and the antichrist became practically equivalent concepts to Wycliffe. Yet there are passages that are moderate in tone. G. V. Lechler identifies three stages in Wycliffe's relations with the papacy. The first step, which carried him to the outbreak of the schism, involves moderate recognition of the papal primacy. The second, which carried him to 1381, is marked by an estrangement from the papacy and the third shows him in sharp contest. However, Wycliffe reached no valuation of the papacy, before the outbreak of the schism, different from his later appraisal. If in his last years he identified the papacy with antichristianity, the dispensability of this papacy was strong in his mind before the schism. It was this very man who labored to bring about the recognition of Urban VI (1378–1389), which appears to contradict his former attitude and to demand an explanation. Wycliffe's influence was never greater than at the moment when pope and antipope sent their ambassadors to England in order to gain recognition for themselves. In the ambassadors' presence, he delivered an opinion before parliament, in an important ecclesiastical political question (the matter of the right of asylum in Westminster Abbey), that showed a position that was to the liking of the State. How Wycliffe came to be active in the interest of Urban is seen in passages in his latest writings in which he expressed himself in regard to the papacy in a favorable sense. On the other hand he states that it is not necessary to go either to Rome or to Avignon in order to seek a decision from the pope, since the triune God is everywhere. It seems clear that Wycliffe was an opponent of the papacy that had developed since Constantine, that the pope is Christ. He taught that the Church can continue to exist even though it has no visible leader, but there could be no damage when the Church possesses a leader of the right kind. To distinguish between what the pope should be, if one is necessary, and the pope as he appeared in Wycliffe's day was the purpose of his book on the power of the pope. The Church militant, Wycliffe taught, needs a head—but one whom God gives the Church. The elector (cardinal) can only make someone a pope if the choice relates to one who is chosen by God. But that is not always the case. It may be that the elector is himself not predestined and chooses one who is in the same position—a veritable Antichrist. According to Wycliffe, the one who in teaching and life most nearly follows Jesus and Saint Peter should be regarded as a true pope. Wycliffe distinguished between what he saw as the true papacy from the false papacy. Since all signs indicated that Urban VI was a reforming and consequently a "true" pope, the enthusiasm that Wycliffe manifested for him is easily understood. These views concerning the Church and church government are those which are brought forward in the last books of his Summa, "De simonia, de apostasia, de blasphemia." The battle over the theses was less significant than the one he waged against the monastic orders when he saw the hopes quenched which had gathered around the "reform pope," and when he was withdrawn from the scene as an ecclesiastical politician and occupied himself exclusively with the question of the reform of the Church. His teachings concerning the danger attaching to the secularizing of the Church put Wycliffe into line with the mendicant orders, since in 1377 Minorites were his defenders. In the last chapters of his De civili dominio, there are traces of a rift. When he stated that "the case of the orders which hold property is that of them all," the mendicant orders turned against him and from that time Wycliffe began a struggle which continued till his death. This battle against what he saw as an imperialized papacy and its supporters, the "sects," as he called the monastic orders, takes up a large space not only in his later works as the Trialogus, Dialogus, Opus evangelicum, and in his sermons, but also in a series of sharp tracts and polemical productions in Latin and English (of which those issued in his later years have been collected as "Polemical Writings"). In these he teaches that the Church needs no new sects. Sufficient for it now is the religion of Christ which sufficed in the first three centuries of its existence. The monastic orders are bodies that are not supported by the Bible, and must be abolished together with their possessions. Such teaching, particularly in sermons, had one immediate effect—a serious uprising of the people. The monks were deprived of alms and were asked to apply themselves to manual labor. These teachings had more important results upon the orders and their possessions in Bohemia, where the instructions of the "Evangelical master" were followed to the letter in such a way that the noble foundations and practically the whole of the property of the Church were sacrificed. But the result was not as Wycliffe wanted it in England because the property fell not to the State but to the barons of the land. The scope of the conflict in England widened since it no longer involved the mendicant monks alone, but took in the entire hierarchy. An element of the contest appears in Wycliffe's doctrine of the Lord's Supper. Wycliffe believed that the Bible ought to be the common possession of all Christians, and needed to be made available for common use in the language of the people. National honor seemed to require this, since members of the nobility possessed the Bible in French. Portions of the Bible had been translated into English, but there was no complete translation. Wycliffe set himself to the task. While it is not possible exactly to define his part in the translation, based on the Vulgate (Latin translation), there is no doubt that it was his initiative, and that the success of the project was due to his leadership. From him comes the translation of the New Testament, which was smoother, clearer, and more readable than the interpretation of the Old Testament by his friend Nicholas of Hereford. 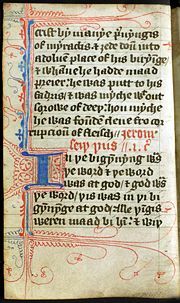 Wycliffe’s younger contemporary, John Purvey, revised the whole Bible in 1388. Therefore, the mass of the people came into possession of the Bible thanks to early innovations in printing and more traditional bookmaking workshops. At the same time, the cry of his opponents could be heard saying, "The jewel of the clergy has become the toy of the laity." In spite of the zeal with which the hierarchy sought to destroy it due to what they saw as mistranslations and erroneous commentary, there still exist about 150 manuscripts, complete or partial, containing the translation in its revised form. From this, one may easily infer how widely diffused it was in the fifteenth century. For this reason the Wycliffites in England were often designated by their opponents as "Bible men." Just as Luther's version had great influence upon the German language, so Wycliffe's, by reason of its clarity, beauty, and strength, influenced English, as the "King James Version" was later to do. Wycliffe's Bible, as it came to be known, was widely distributed throughout England. The Church denounced it as an unauthorized translation. John Wycliffe gives his Bible translation to Lollards. Wycliffe aimed to do away with the existing hierarchy and replace it with the "poor priests" who lived in poverty, were bound by no vows, had received no formal consecration, and preached the Gospel to the people. These itinerant preachers spread the teachings of Wycliffe. Two by two they went, barefoot, wearing long dark-red robes and carrying a staff in the hand, the latter having symbolic reference to their pastoral calling, and passed from place to place preaching the sovereignty of God. The bull of Gregory XI impressed upon them the name of Lollards, intended as an opprobrious epithet, but it became, to them, a name of honor. Even in Wycliffe's time the "Lollards" had reached wide circles in England and preached "God's law, without which no one could be justified." Lollardy or Lollardry was the political and religious movement of the Lollards from the late fourteenth century to early in the time of the English Reformation. Although Lollardy can be said to have originated in the writings of Wycliffe, it is true that the Lollards had no central doctrine. Likewise, being a decentralized movement, Lollardy neither had nor proposed any singular authority. The movement associated itself with many different ideas, but individual Lollards did not necessarily have to agree with every tenet. Fundamentally, Lollards were anticlerical. They believed the Catholic Church to be corrupt in many ways and looked to Scripture as the basis for their religion. To provide an authority for religion outside of the Church, Lollards began the movement towards a translation of the Bible into the vernacular (native language). Wycliffe translated many passages himself. Immediately upon going public, Lollardy was attacked as heresy. At first, Wycliffe and Lollardy were protected by John of Gaunt and anti-clerical nobility, who were most likely interested in using Lollard-advocated clerical reform to create a new source of revenue from England’s monasteries. The University of Oxford also protected Wycliffe and allowed him to hold his position at the university in spite of his views on the grounds of academic freedom, which also gave some protection to the academics who supported it within that institution. Lollardy first faced serious persecution after the Peasant’s Revolt in 1381. While Wycliffe and other Lollards opposed the revolt, one of the peasants’ leaders, John Ball, preached Lollardy. The royalty and nobility then found Lollardy to be a threat not just to the Church, but to all the English social order. The Lollards' small measure of protection evaporated. This change in status was also affected by the removal of John of Gaunt from the scene, when he left England in pursuit of the throne of Castile, which he claimed through his second wife. Lollardy was strongly resisted by both the religious and secular authorities. Among those opposing it was Thomas Arundel, Archbishop of Canterbury. 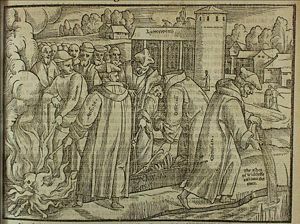 King Henry IV passed the De heretico comburendo in 1401, not specifically against the Lollards, but prohibiting the translating or owning of the Bible and authorizing the heretics to be burned at the stake. In the summer of 1381, Wycliffe formulated his doctrine of the Lord's Supper in twelve short sentences, and made it a duty to advocate it everywhere. Then, the English hierarchy proceeded against him. The chancellor of the University of Oxford had some of the declarations pronounced heretical. When this fact was announced to Wycliffe, he declared that no one could change his convictions. He then appealed to the King, not to the pope or to the ecclesiastical authorities of the land. He published his great confession upon the subject and also a second writing in English intended for the common people. His pronouncements were no longer limited to the classroom. They spread to the masses. In the midst of this commotion came the Peasants' Revolt of 1381. Although Wycliffe disapproved of the revolt, he was blamed. Yet his friend and protector, John of Gaunt, was the most hated by the rebels, and where Wycliffe's influence was greatest the uprising found the least support. While in general the aim of the revolt was against the spiritual nobility, this came about because they were nobles, not because they were churchmen. Wycliffe's old enemy, Courtenay, now Archbishop of Canterbury, called an ecclesiastical assembly of notables to London in 1382. During the consultations an earthquake occurred on May 21. The participants were terrified and wished to break up the assembly, but Courtenay declared the earthquake a favorable sign which meant the purification of the earth from erroneous doctrine. Of the 24 propositions attributed to Wycliffe without mentioning his name, ten were declared heretical and fourteen erroneous. The former had reference to the transformation in the sacrament, the latter to matters of church order and institutions. It was forbidden from that time to hold these opinions or to advance them in sermons or in academic discussions. All persons disregarding this order were to be subject to prosecution. To accomplish this, the help of the State was necessary; but the commons rejected the bill. The king, however, had a decree issued which permitted the arrest of those in error. The citadel of the reformatory movement was Oxford, where Wycliffe's most active helpers were; these were laid under the ban and summoned to recant, and Nicholas of Hereford went to Rome to appeal. In similar fashion the poor priests were hindered in their work. On November 18, 1382, Wycliffe was summoned before a synod at Oxford. He appeared, though apparently broken in body in consequence of a stroke, but nevertheless determined. He still commanded the favor of the court and of parliament, to which he addressed a memorial. He was neither excommunicated then, nor deprived of his living. Wycliffe returned to Lutterworth and sent out tracts against the monks and Urban VI, since the latter, contrary to the hopes of Wycliffe, had not turned out to be a reforming or "true" pope, but had become involved in mischievous conflicts. The crusade in Flanders aroused the Reformer's biting scorn, while his sermons became fuller-voiced and dealt with what he saw as the imperfections of the Church. The literary achievements of Wycliffe's last days, such as the Trialogus, stand at the peak of the knowledge of his day. His last work, the Opus evangelicum, the last part of which he named in characteristic fashion "Of Antichrist," remained uncompleted. While he was hearing mass in the parish church on Holy Innocents' Day, December 28, 1384, he was again stricken with apoplexy and died on the last day of the year. Shortly after his death, the great Hussite movement arose and spread through Western Europe. The Council of Constance declared Wycliffe (on May 4, 1415) a stiff-necked heretic and under the ban of the Church. It was decreed that his books be burned and his remains be exhumed. The latter did not happen till twelve years afterward, when at the command of Pope Martin V they were dug up, burned, and the ashes cast into the river Swift that flows through Lutterworth. Wyclif was spare, and probably never of robust health, but he was not an ascetic. He was fond of a good meal. In temper he was quick, in mind clear, in moral character unblemished. Towards his enemies he was sharp, but never coarse or ribald. William Thorpe, a young contemporary standing in the court of Archbishop Arundel, bore testimony that "he was emaciated in body and well-nigh destitute of strength, and in conduct most innocent. Very many of the chief men of England conferred with him, loved him dearly, wrote down his sayings and followed his manner of life." Wycliffe's first encounter with the official Church of his time was prompted by his zeal in the interests of the State. His first tracts and greater works of ecclesiastical-political content defended the privileges of the State, and from these sources developed a strife out of which the next phases could hardly be determined. One who studies these books in the order of their production with reference to their inner content finds a direct development with a strong reformatory tendency. This was not originally doctrinal. When it later took up matters of dogma, as in the teaching concerning transubstantiation, the purpose was the return to original simplicity in the government of the Church. But it would have been against the diplomatic practice of the time to have sent to the peace congress at Bruges, in which the Curia had an essential part, a participant who had become known at home by his allegedly heretical teaching. Since it was from dealing with ecclesiastical-political questions that Wycliffe turned to reformatory activities, the former have a large part in his reformatory writings. While he took his start in affairs of church policy from the English legislation which was passed in the times of Edward I, he declined the connection into which his contemporaries brought it under the lead of Occam. Indeed, he distinctly disavows taking his conclusions from Occam, and avers that he draws them from Scripture, and that they were supported by the Doctors of the Church. Thus dependence upon earlier schismatic parties in the Church, which he never mentions in his writings (as though he had never derived anything from them), is counter indicated, and attention is directed to the true sources in Scripture, to which he added the collections of canons of the Church. Wycliffe would have had nothing to gain by professing indebtedness to "heretical" parties or to opponents of the papacy. His reference to Scripture and orthodox Fathers as authorities is what might have been expected. So far as his polemics accord with those of earlier antagonists of the papacy, it is fair to assume that he was not ignorant of them and was influenced by them. The Bible alone was authoritative and, according to his own conviction and that of his disciples, was fully sufficient for the government of this world (De sufficientia legis Christi). Out of it he drew his comprehensive statements in support of his reformatory views, after intense study and many spiritual conflicts. He tells that as a beginner he was desperate to comprehend the passages dealing with the activities of the divine Word, until by the grace of God he was able to gather the right sense of Scripture, which he then understood. But that was not a light task. Without knowledge of the Bible there can be no peace in the life of the Church or of society, and outside of it there is no real and abiding good. It is the one authority for the faith. These teachings Wycliffe promulgated in his great work on the truth of Scripture, and in other greater and lesser writings. For him the Bible was the fundamental source of Christianity which is binding on all men. Wycliffe was called "Doctor evangelicus" by his English and Bohemian followers. Of all the reformers who preceded Martin Luther, Wycliffe put most emphasis on Scripture: "Even though there were a hundred popes and though every mendicant monk were a cardinal, they would be entitled to confidence only in so far as they accorded with the Bible." Therefore in this early period it was Wycliffe who recognized and formulated one of the two great formal principles of the Reformation—the unique authority of the Bible for the belief and life of the Christian. It is not enough realized that, well before Luther, Wycliffe also recognized the other great Reformation doctrine, that of justification by faith, though not in fully worked out form as Luther achieved. In Christ Stilling the Storm he wrote: "If a man believe in Christ, and make a point of his belief, then the promise that God hath made to come into the land of light shall be given by virtue of Christ, to all men that make this the chief matter." Wycliffe earned his great repute as a philosopher at an early date. Henry Knighton says that in philosophy he was second to none, and in scholastic discipline incomparable. If this pronouncement seems hardly justified, now that Wycliffe's writings are in print, it must be borne in mind that not all his philosophical works are extant. If Wycliffe was in philosophy the superior of his contemporaries and had no equal in scholastic discipline, he belongs with the series of great scholastic philosophers and theologians in which England in the Middle Ages was so rich—with Alexander of Hales, Roger Bacon, Duns Scotus, [Occam]], and Bradwardine. There was a period in his life when he devoted himself exclusively to scholastic philosophy—"when I was still a logician," he later used to say. The first "heresy" which "he cast forth into the world" rests as much upon philosophical as upon theological grounds. In Plato, knowledge of whom came to Wycliffe through Saint Augustine, he saw traces of a knowledge of the Trinity, and he championed the doctrine of ideas as against Aristotle. He said that Democritus, Plato, Augustine, and Grosseteste far outranked Aristotle. In Aristotle he missed the provision for the immortality of the soul, and in his ethics the tendency toward the eternal. He was a close follower of Augustine, so much so that he was called "John of Augustine" by his pupils. In some of his teachings, as in De annihilatione, the influence of Thomas Aquinas can be detected. So far as his relations to the philosophers of the Middle Ages are concerned, he held to realism as opposed to the nominalism advanced by Occam, although in questions that had to do with ecclesiastical politics he was related to Occam and indeed went beyond him. His views are based upon the conviction of the reality of the universal, and he employed realism in order to avoid dogmatic difficulties. The uni-divine existence in the Trinity is the real universal of the three Persons, and in the Eucharist the ever-real presence of Christ justifies the deliverance that complete reality is compatible with the spatial division of the existence. The center of Wycliffe's philosophical system is formed by the doctrine of the prior existence in the thought of God of all things and events. This involves the definiteness of things and especially their number, so that neither their infinity, infinite extension, nor infinite divisibility can be assumed. Space consists of a number of points of space determined from eternity, and time of exactly such a number of moments, and the number of these is known only to the divine spirit. Geometrical figures consist of arranged series of points, and enlargement or diminution of these figures rests upon the addition or subtraction of points. Because the existence of these points of space as such, that is, as truly indivisible unities, has its basis in the fact that the points are one with the bodies that fill them; because, therefore, all possible space is coincident with the physical world (as in Wycliffe's system, in general, reality and possibility correspond), there can as little be a vacuum as bounding surfaces that are common to different bodies. The assumption of such surfaces impinges, according to Wycliffe, upon the contradictory principle as does the conception of a truly continuous transition of one condition into another. Wycliffe's doctrine of atoms connects itself, therefore, with the doctrine of the composition of time from real moments, but is distinguished by the denial of interspaces as assumed in other systems. From the identity of space and the physical world, and the circular motion of the heavens, Wycliffe deduces the spherical form of the universe. ↑ http://www.lwbc.co.uk/reformation_of_wycliffe.htm. Retrieved October 29, 2008. ↑ New Schaff-Herzog Encyclopedia of Religious Knowledge, Vol. XII: Trench – Zwingli. Schaff, Philip (1819–1893) (Grand Rapids, MI: Baker Book House, 1953 [reprint]), pp. 454–455, http://www.ccel.org/ccel/schaff/encyc12.w.x.html. Retrieved October 29, 2008. ↑ Dictionary of National Biography, http://www.oxforddnb.com, pp. 1xiii, 208–209. Retrieved October 29, 2008. ↑ An excellent account of this dispute between the bishop and the protectors of Wycliffe is given in the Chronicon Angliae, the gist of which is quoted in Dictionary of National Biography, http://www.oxforddnb.com, pp. lxiii, 206–207. Retrieved October 29, 2008. ↑ Gotthard Victor Lechler and Peter Lorimer, John Wiclif and His English Precursors, http://books.google.com/books?vid=OCLC03564039&id=4YCjERNaURoC&pg=PA1&dq=John+Wiclif+and+his+English+Precursors. Retrieved October 29, 2008. ↑ http://www.ccel.org/s/schaff/encyc/encyc12/htm/TOC.htm. Retrieved October 29, 2008. ↑ History of the Christian Church, Chapter V, Reformers before the Reformation, by Philip Schaff, http://www.ccel.org/s/schaff/history/6_ch05.htm. Retrieved October 29, 2008. John Wyclif Stanford Encyclopedia of Philosophy. John Wyclif's Political Thought Stanford Encyclopedia of Philosophy. The History of Protestantism, V1, Bk 2 (Wicliffe and His Times) by James A. Wylie. Medieval Sourcebook, Pope Gregory XI, The Condemnation of Wycliffe 1382 and Wycliffe's Reply, 1384. This page was last modified on 23 May 2018, at 16:02.